NASHVILLE, Tenn.--(BUSINESS WIRE)--As the construction boom continues, sustainable urban building practices should be incorporated into every step of urban planning and development. 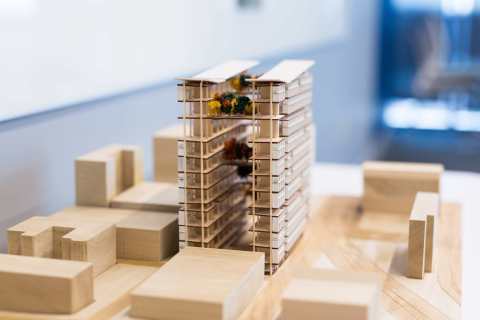 Fourth year architecture students in the University of Tennessee College of Architecture and Design participated in the Nashville Civic Design Center’s (NCDC) Urban Design Studio challenge to design a wood-framed, high-rise multi-use structure. On December 4, the architectural students participated in the final review of the 15-story Timber Tower Studio project, which was co-sponsored by Nashville-based LP Building Products, a leader in high-performance building solutions, and the UT-Oak Ridge National Laboratory Governor’s Chair for High-Performance Energy Practices in Urban Environments. Founded in 2000, the Nashville Civic Design Center (NCDC) is a nonprofit organization whose mission is to elevate the quality of Nashville’s built environment and to promote public participation in the creation of a more beautiful and functional city for all. The NCDC promotes the Ten Principles of The Plan of Nashville, offers public education on civic design, provides consultation on civic and other community development projects, facilitates public dialogue, and researches and publishes reports on various civic design issues. For more information, please visit www.civicdesigncenter.org. Design. Make. Transform. Founded in 1965, the College of Architecture and Design enriches quality of life in the region and world through transformational design education, the Governor’s Chair for Energy + Urbanism, design/build program, key partnerships and award-winning facilities including the state-of-the-art Fab Lab. The college is comprised of more than 420 undergraduate and graduate students in architecture, interior architecture and landscape architecture. Visit archdesign.utk.edu to learn more. Louisiana-Pacific Corporation (LP Building Products) is a leading manufacturer of quality engineered wood building materials including OSB, structural framing products, and exterior siding for use in residential, industrial and light commercial construction. From manufacturing facilities in the United States, Canada, Chile and Brazil, LP products are sold to builders and homeowners through building materials distributors and dealers and retail home centers. Founded in 1973, LP is headquartered in Nashville, Tennessee, and traded on the New York Stock Exchange under LPX. For more information, please visit www.LPCorp.com. The Nashville Civic Design Center and LP Building Products hosted a UT architecture student design studio focused on tall wood.